You may have grown up with sloppy Joes and never tried making them; you may have never tried sloppy Joes but want in on what makes them so great—either way, you’ve come to the right place. Sloppy Joes have been a household American favorite since the early twentieth century and invoke some serious nostalgia. Read on to learn how to make the best sloppy Joes of your life! Basic sloppy Joes are an excellent weeknight meal choice because of their ease. The ingredients are simple, cheap and come together quick—you can even make the meat for sloppy Joes a day or two ahead of time and store it in the refrigerator. If you’ve never made sloppy Joes before, don’t sweat it! This simple recipe is the perfect place to start. Step 1: First, in a large skillet, combine the ground beef, bell pepper and onion. Cover and cook over medium heat for 8 to 10 minutes or until the beef is thoroughly cooked, stirring frequently. Drain well. Step 2: Next, add all of the remaining ingredients except the buns and mix well. Cover the skillet and summer for 15 to 20 minutes, stirring occasionally. Step 3: Spoon mixture onto buns and stir. Serve with chips, veggies or a salad to make it a complete meal! Sloppy Joes are also an ideal recipe for the slow cooker. Allowing the ground beef mixture to simmer all day gives the flavors time to blend for a delicious dinner that’ll have everyone fighting for seconds. This is also a great method for when you need to prep something for a party but don’t have a lot of time to stand over the stove (this sloppy joe recipe makes enough to serve 16 people). Go ahead. Kick back, relax and let the slow cooker do the work for you! Step 1: First, in a large skillet, cook ground beef, onions, celery and bell pepper over medium-high heat for 5 to 7 minutes or until beef is thoroughly cooked, stirring frequently. Drain. Step 2: Next, combine the ground beef mixture and remaining ingredients (except buns) into a 3 ½- to 4-quart slow cooker and mix well. Cover and cook on low setting for 4 to 6 hours. Step 3: Stir the mixture and then spoon it onto buns. The best meat for sloppy Joes is ground beef—it’s the most popular meat choice for sloppy Joes and is featured in the original recipes. You’ll want to use lean ground beef, or the ground beef you would typically use for a hamburger patty. Hamburger patties usually call for 80% lean ground beef; this means the beef is 20% fat, so it’s leaner but still has a lot of flavor. You may opt for even leaner ground beef, such as 90 to 95% lean, which will still work for this recipe. Not a big ground beef fan? You can use ground pork or ground turkey in place of ground beef. Ground turkey is a nice option for those looking to make a healthified version of sloppy Joes as it’s a leaner meat than ground beef. Sloppy Joe sauce is characterized by its tomato base flavor, which often comes from ketchup and tomato sauce or paste. Many recipes will add an extra flavor punch with Worcestershire sauce and onion. Our basic sloppy Joes recipe calls for all of these ingredients plus a tablespoon of brown sugar to give the sauce a little extra sweetness. You can even add some veggies by chopping green bell peppers and add some color to the sauce mix for flavor and crunch. If you prefer your sloppy Joes spicy, ditch the brown sugar and add some chili powder and a dash of hot pepper sauce instead. Being a sandwich that features a loose meat mixture, sloppy Joes are naturally, well, sloppy. But that’s what makes them so good! Pile the mixture high on a bun, grab a napkin (or two) and dig in. Sloppy Joes taste delicious just the way they are, but if you like your dinners with extra cheese, you can always add some American or cheddar cheese on top of the saucy sloppy Joe before eating. If you are using canned tomato sauce or paste in your sloppy Joe recipe along with ketchup, the mixture should gradually thicken on its own after simmering on the stove for 10 to 15 minutes, so there’s no need to add additional ingredients like flour or cornstarch. Serve sloppy Joes on hamburger buns or sesame buns (or whatever type of bun your family prefers) and enjoy! 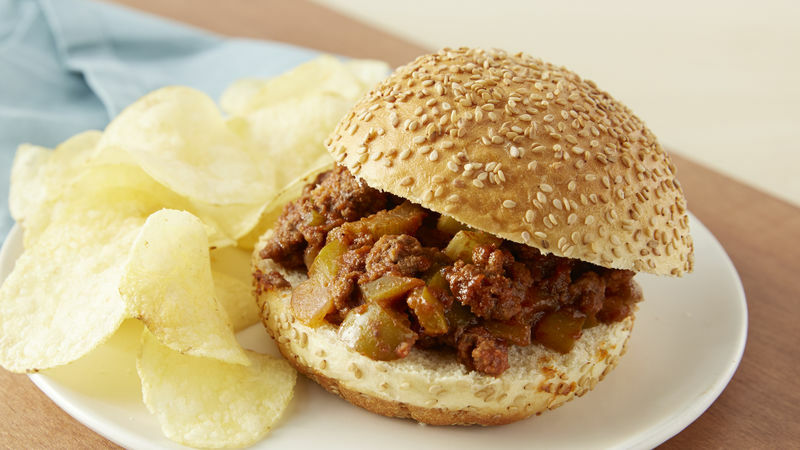 Sloppy Joes can be paired with pretty much any typical barbecue side: chips, salad, potatoes, fresh veggies and pasta salads are all great options. Need some inspiration? We got you. Sloppy Joes are super easy to make, and even better, they keep well as leftovers. If you want to save yourself some time before a party or family dinner, you can make the sloppy Joe mixture a few days ahead of time and store it in the refrigerator in an airtight, sealed container. When you’re ready to serve, simply reheat on the stove or in the microwave and serve on fresh buns. You can just as easily freeze the sloppy Joe mixture too—store in an airtight, freezer-safe container (make sure the mixture has cooled before storing) and keep in your freezer for up to two months. Allow it to defrost overnight in your refrigerator and then proceed with the reheating instructions. Now that you’re a pro at making sloppy Joes, why stop at the basic sandwich? We at Pillsbury love sloppy Joes so much, we made recipes inspired by the traditional recipe like sloppy Joe casseroles, sloppy Joe pockets, sloppy Joe mini meals and more. With these recipes, you’ll have an excuse to make sloppy Joes for dinner every night (you’re welcome). Hungry for more? Browse all of our super easy dinner recipes.